Do you sometimes have the feeling that there are two bodies on the mat: the body you have, and the body you fantasize about? cross-cultural studies (the attempt to understand how asana feels in the bodies of different practitioners depending upon their power within the hunger games of global capitalism). Psychoanalysis, I’ll admit, is a rather greasy and chipped lens through which to view yoga. It’s atheism and materialism will alienate many. It can be a killjoy to most “spiritual” aspirations and all feel-good marketing. Plus, large swaths of the Indian intelligentsia charge that Western academics like Wendy Doniger and Jeffrey Kripal have been using it to extend the habit of pathologizing their culture, ever since the colonial invention of “Indology”. I’d like to do my best to set the politics of this gingerly aside (and to defer the issue of whether psychoanalysis offers any cross-cultural validity) and simply use it to see if it offers compelling insight into why some of us might feel a tad schizoid on the yoga mat, practicing in or with a body we may hate with one breath, and exalt with the next. Psychoanalytic insights into how early family structures influence the formation of the self now have widespread cultural currency. We know that how a child is cared for or neglected, how her space is invaded or respected, how she is made to feel guilty for existing, or like she’s the very centre of the universe — this is crucial history for understanding the kind of body and world she feels herself to occupy as an adult. If yoga is pursued by many today in an attempt to feel comfortable in their skin, well-regulated in relationship, mindful of their needs without feeling needy, interdependent as opposed to co-dependent — the broad findings of psychoanalysis can be very useful. But I’ll focus on just one of its findings here. Decades later, in her amazing work on the psychology of anorexia nervosa, Suzie Orbach extended Winnicott’s idea of the “false self” into the idea of a “false body”. She suggests that as soon as the body reveals itself as needy, vulnerable, farting, menstruating, asymmetrical, or in pain, a sense of shame might overcome the person that can only be managed by fantasizing a body that must be incapable of producing these dark things. The false body is toxically vitalized by the anxious hope to please others through the performance of beauty and strength. The “truer” body — that vessel of aches and pains, fear and trembling, insomnia, frustrated urges and uncertain purpose — doesn’t go away, of course. It is still the lived-in body, wearing the fantasy as a disguise. [W]here the developing child has not had a chance to experience its physicality as good, wholesome and essentially all right, it has little chance to live in an authentically experienced body. A false body is then fashioned which conceals the feelings of discomfort and insecurity with regard to the hidden or undeveloped ‘inner body’. The ‘false body’ is, like the ‘false self’, precarious. It works as a defense against the unaccepted embryonic real body. Again, like the false self, it is malleable. In attempting to gain external acceptance, the “false body’ is fluid and manipulable. The woman in the ‘false body’ becomes used to trying to reform it along approved-of lines. It does not provide the individual with a stable core but a physical plasticity expressing a complex of inner feelings. If you find this idea resonant (or not) — if you’ve felt in practice the dual bodies that psychoanalysis seems to describe so well — I’d love to hear from you in the comments, or privately at threadsofyoga@gmail.com. Muktibodhananda. Hatha yoga pradipika: the light on hatha yoga : including the original sanskrit text of the Hatha Yoga Pradipika with English translation. Munger: Bihar School of Yoga, 1985. Print. Orbach, Susie. Hunger strike: the anorectic’s struggle as a metaphor for our age. New York: Norton, 1986. Winnicott, D. W.. The maturational processes and the facilitating environment; studies in the theory of emotional development,. New York: International Universities Press, 1965. Print. And: shouts to Melanie Klein, Anna Guest-Jelley, Chelsea Roff and Roseanne Harvey, who are doing such excellent work on the body-image front in yoga culture. Their work is opening a big door for me and many others. And to Rachael Blyth for referring me to Orbach: thank you so much. I would say that injuries might be happening as much from attachment to a “youthful” body as there is to a body we “want” rather than one we actually have. I do not have a particularly robust body, and that is something I’ve had to learn to accept–that many people can do things that I just can’t. But also as a middle-aged practitioner, there were practices I was actually–and perhaps luckily–taught were no longer appropriate for people my age. One teacher actually told me that the Ashtanga series was only appropriate for the young, as otherwise all the jumping made people wreck their knees. Another told me that Chaturanga was particularly dangerous for the shoulder joints, so he only teaches Plank pose. So as we age, we need to adapt our practices to suit our changing bodies, even as we still challenge ourselves to stay as strong and flexible as possible. It’s a tricky line to walk, of course, but we’re individuals, so there are no rules to follow (and frankly as the wife of a medical researcher, I can tell you there is still much that is not understood about the human body). Our Western culture tells us when we are children that we can BE anything we want if only we set our minds to it (how many children’s movies and books have this message?). It also tells us that we can have the body we want if we do/buy the right things, and also that we can stay young by doing/buying things. These are obviously all illusions that we must let go of not just to attain contentment (the real aim of yoga) but to appreciate and work what what we actually do have. Yes, I absolutely feel like I hurt myself by practicing in the body I fantasized, rather than the body I have. And, after almost two years of working in the injured body, I finally feel like I have a better embodied practice. In that way, the pain encouraged me to stay contained. A point somewhat related to your last few paragraphs – I’ve been practicing for a long time (more than 20 years). But, I took up more intensive asana practice about 10 years ago partially due to an seeming inability to meditate on a regular basis – something about sitting on the cushion felt unworkable to me. Yoga gave me the opportunity to be present in my body in an accessible way that felt beyond my capabilities in meditation. So working through the body helped me “straighten out” my inner being. And now I’m able to meditate regularly and (for the most part) easily. In that way I suppose I also agree with Saraswati. But integration is still a fantastic struggle, so I look forward to hearing what others have to say on this topic. I’ve asked friends in Satyananda’s lineage why he would so sideline yama and niyama in his commentary, and wasn’t satisfied with their response, which simply parroted his assertion. But if I read the text in order, it very much does invoke purification of mind, with even more structures than Patañjali. I read this as clearly situating ethics, generosity, meditation, and all the energetic containment and purification structures of niyama a clear prerequisite for the HYP’s kundalini and bandha-focused asana. Satyananda’s “schizophrenia” threat then can read as a modernist resistance against a classical yogic mental discipline. Maybe it’s a skillful elision, recognizing that moderns will join the discipline more fully from a body foundation rather than a difficult ethical and lifestyle inquiry. Or maybe he sees his meditation students chafing against ideas that they must purify the mind. In this sense he repeats a Tantric resistance to Patañjali, which constructs the narrative of a past “purer” time in which people could meditate (enter dhyāna), but now in these degenerate times, we need stringer and faster methods. Stronger and faster, and something we can do because we’re unable to meditate. Sounds familiar. Thank you, Sean. That fills in some gaps. I wonder how prevalent Satyananda’s gloss is in Hatha culture. Something to ask James Mallinson! Just stumbled upon this. It is definitely one for the philologist. The passage on the ten yamas and ten niyamas (which is first found in some late first-millennium Vaiṣṇava tantras) is not found in most manuscripts of the Haṭhapradīpikā. It is inserted in some, but was probably not in the oldest recensions (for why not, read on). So Satyananda and Rieker are both right. But although the original HP did not give lists of yamas and niyamas, it did not say they should be ignored and refers to them in passing when at 1.38 (in a verse derivative of Dattātreyayogaśāstra 32c-33d) it says that a restrained diet (mitāhāra) is the best of the yamas and ahiṃsā the best of the niyamas. In the interpolated passage both mitāhāra and ahiṃsā are yamas, which is why I think it is not original (although I am yet to find a list of niyamas which included ahiṃsā and the HP is not always coherent, so I may be wrong). The more brahmanical haṭha texts (e.g. Vasiṣṭhasaṃhitā + some Yoga Upaniṣads) teach the yamas and niyamas, listing, like the HP interpolation, ten of each (unlike the Pātañjalayogaśāstra, which teaches five of each). The haṭha texts of Nāth/tantric orientation (HP, Gorakṣaśataka, Vivekamārtaṇḍa, Śivasaṃhitā etc.) do not teach the yamas and niyamas. This does not mean that they had no rules, however, as, like the many 6-aṅga tantric systems of yoga, which also do not teach the yamas and niyamas, they would have been part of larger systems in which certain ethical principles were enjoined. Ha. So my question is — wouldn’t they sell more clothes with “Gentle is the New Advanced?” Did you pitch them? Oh man, this feels very true to me. This false body follows me around EVERYWHERE, and it has since I was very young. I’m a woman; I’ve always judged myself against a fantasy standard I wish I could embody but only partially manage. Sometimes it follows me to asana practice, but sometimes it is repelled by that same practice and I relax in to the home of my true body. It’s harder now as I age, and my true body, that I was learning to recognize, has started to change. A whole new kind of denial is now arising in me. Dear Matthew, thank you so much for your post. And for your book “Threads of Yoga” that I have enjoyed enormously. It voices so many things that I have thought or not thought maybe but sensed, but not had the words to even think about. I have practiced yoga for 20 years and spent 12 years in the ashtanga hype. 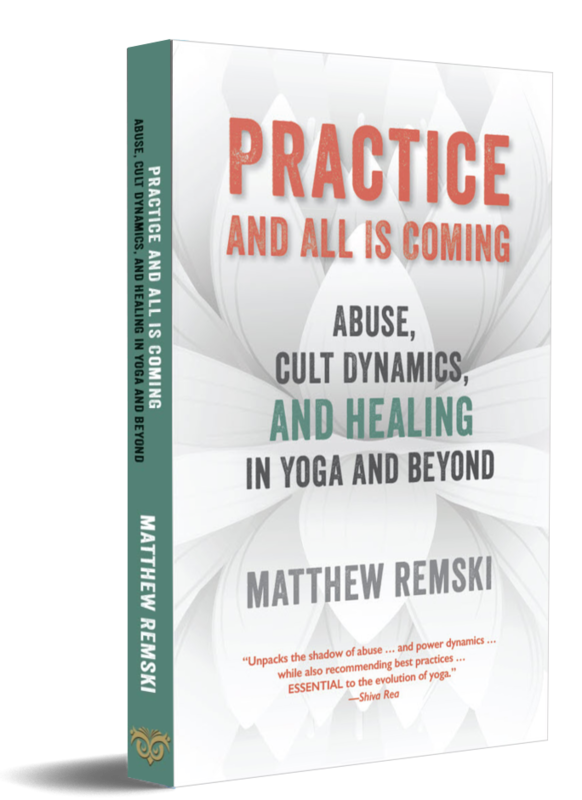 I can translate the idea of practicing in another body as a struggle to stay out of really feeling my body – as I spent many years of intense home-practice doing. Thinking I was practicing, but really numbing the connection to what was “really” going on. Ujjayi has that capacity to create an almost trancelike state, that feels enormously addictive and that, in stead of bringing in touch with deeper emotional layers and patterns, numbs them out. I did not want to feel myself. And I went for a practice that effectively helped me numb and control…for a while anyway. Yoga became part of my survival-strategy in stead of a way out (or in if you want). I think it started out okay. Yoga was really an eye-opener in the start. That I could be in my body in a novel way, not run away from pain and discomfort. Get to know it. Be curious. It changed with ashtanga, that triggered a side of me, that felt in control and that could present an image to the world that fit with the way I wanted to see myself. A dream of invulnerability, strength, youth, immortality really, I practiced with a painful body, day after day, following the series, always pain in my lower back, my neck, and lying to myself about it. Not wanting to let go of my addiction. The end-result for me was several serious injuries that woke me up. For about a year I had no choice (pain) but to just be in my body, realizing that I was not in control. The fantasy died then and the insight from that has stayed with me. I am struggling right now to put this into words, but what I have realized I was caught so much up in, was exactly that, the idea of “having” a body in stead of being one. And having my life fall apart, my body fall apart taught me a valuable lesson: That I had invested seriously in NOT being vulnerable, not falling apart, not showing myself, and that I had used yoga as a tool for it. Something about the patriarchal hierarchical structure of ashtanga, that just fits so well with the physical culture of the western world and that works together with the old patterns of child not allowed to be embodied. While we are told and tell ourselves the opposite. I am really interested in, how to practice differently (which I am today), but also how to teach differently so as not to feed into this culture of buying perfection. I think it is thought-provoking that we as women, I being one of them, buy into a culture, that promotes the idea of perfecting bodies. I read a book by Carol lee Flinders called “The Values of Belonging” and found it a very helpful lens for this whole discussion. Anyway … I am really happy that this discussion is happening. Bows! This is totally fascinating. I’ve noticed a split in the body I have and a fantasy body. For me, the dichotomy is simply ‘injured’ and ‘not injured.’ When I’m practicing with an injured body, I remember the non-injured one, and try to work back to that. When I’m not injured, I fear the remembered injured body, and try to design / constrain / devote my practice towards the ideal of non-injury. I feel a sense of devotion or thanks to all the tiny details in practice that have (in my mind) kept me injury-free that day. It becomes almost a game of micro-management in figuring out the puzzle of what makes the body present itself that day as injury-free. It’s a continuous game of trial and error. There are some moments when it all makes sense, and I’ve figured out the solution to the puzzle, and then there are moments when the bubble bursts and I’m back to the Injured Body. Then the game begins again. Trial and error, until another solution presents itself, and the NonInjured Body returns. So in practice I’m either puzzling over one self or fearing the other. There are days when the bow at the end of practice feels like a bow to the universe to keep this tenuous connection going with the Uninjured Body. As if to say, thank you (Universe, Powers that Be, The Way, The Force) for keeping this Good Body here; please let it be here again tomorrow. Though I try to control it (by figuring out a ‘solution’ to the injury) the Injured Body always returns, with another injury, or the same one, returning. As an aside, I feel that a split personality is intrinsic to living in a commercialized society. There is always a split between the ideal self that the advertiser wants for you, and the actual self that you have for yourself. It is very hard to know one’s real self, the authentic self, when the messages all around us every day present never-ending variations on an Idealized self. Physical and personality ideals are presented constantly via advertising and entertainment. They’re impossible to avoid, so it takes a solid inner practice of some sort to filter them out and connect back to a deeper, truer self. It takes *work* not to internalize the Ideal / false selves we are socialized to emulate. This applies to the yoga world as well, in terms of yoga advertising imagery and idealism. These are some really amazing and important points. I also feel this fantasy body idea is encouraged by teachers or practitioners who lack knowledge regarding the physical body, pathology, injury, aging, and other circumstances which may inform each student’s practice. Fantasy terminology is perpetuating fantasy body. So true. One of my favorite yoga teachers is having her labrum repaired at this very moment. Another teacher at the studio, upon hearing of her injury, said, “What happened, were you just not listening to your body?” This fantasy, which Matthew speaks of often, that if we “listen” there is somehow no way we can be injured, is one of the more pernicious myths perpetuated by some teachers. Why do we injure ourselves? It’s such a complicated issue. Not including our childhood experiences or society pressures – nature demands it. All animals confront their nature in nature. The strongest survive. This is inherent in us. Primal. Rationalizing it takes it to a level where it encounters another need: that to examine and dissect everything. We are stuck in between. Better said perhaps – from where I stand at this moment – finding the center of gravity in between, taking the physical practice of yoga to where I am challenged but not hurt, to where I learn to be (and know the difference) between discomfort and pain. And floating peacefully in that space without clinging to it since that space can also turn into a fortress and keep me from further experiences. Ahhh… to be human.. Conscious and careful address of the stretch reflex (most every yoga student FEELS it) would allow us to direct the “real body/fantasy body” dialectic in service of moksha.